Dr John Papatheohari, Partner and Global Delivery Leader (Strategy & Change) - IBM India, addressed the students and faculty of XLRI as part of the Institute’s CEO interaction forum. The forum is a regular platform for XLers to interact with Industry leaders. Dr John elaborated on the importance of Strategic Transformation and Change in the current Business context and also highlighted the structure, operations and growth of IBM’s Strategy and Change group in India. The forum culminated with a Q&A session wherein queries on Strategy and Change in general and IBM’s operation in particular were addressed. 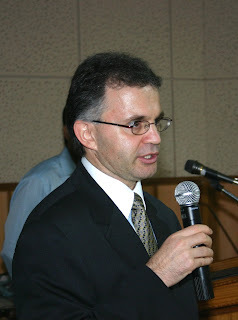 Subsequently, Dr John also took time to interact with the GMP students (GMP is XLRI’s one year full time executive Management program for professionals with more than 5 years of experience) and highlighted the varied scope of opportunities available in the Strategy and Change group for management students with work experience.